The Butte County Sheriff's Department has issued another evacuation order, this time for the area o Stirling City and Inskip. All Butte County schools are closed on Friday, Nov. 9. 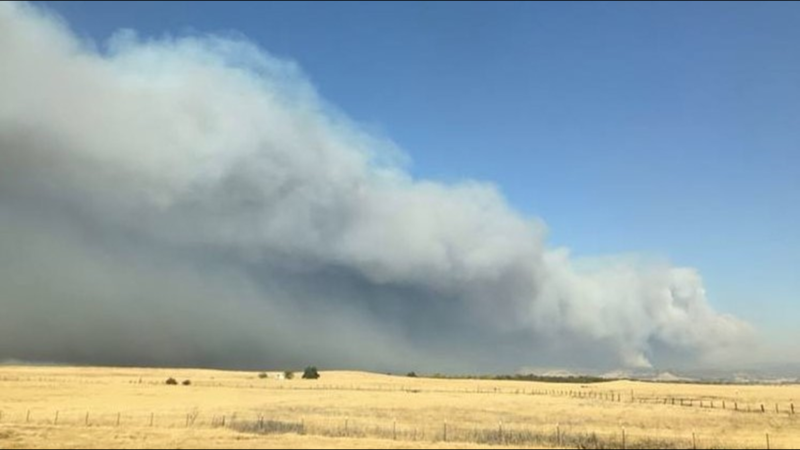 Butte County Sheriff's officials have issues an evacuation order in Upper Magalia, upgrading from the initial evacuation warning for area residents. The evacuation includes residents living in the Humbug, Lovelock, Powellton, Stirling and North Coutelenc areas. If you're evacuating from these areas, an evacuation shelter is open at Glenn County Fairgrounds in Orland at 221 E. Yolo St.
For a complete list of evacuation shelters, click here. New evacuation orders are sprouting up near the City of Chico as the Camp Fire continues its march to the southwest. In a tweet sent out just before 12:30 p.m., the Chico Fire Department outlined evacuation zones, just to the east of the city, that are under threat of the advancing fire. Chico Police officers are actively alerting residents in those evacuation zones. Crews are working around the clock to beat back the flames. So far, there have been no reports of damage in the City of Chico. A fast-moving wildfire that ravaged a Northern California town Thursday sent residents racing to escape on roads that turned into tunnels of fire as thick smoke darkened the daytime sky, wiping out what a Cal Fire official said was a couple of thousand structures. 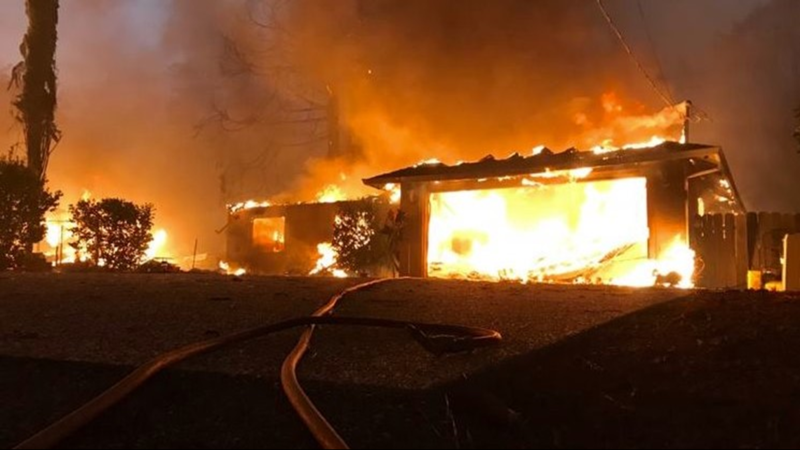 "We were surrounded by fire, we were driving through fire on each side of the road," said police officer Mark Bass, who lives in the hard-hit town of Paradise and works in neighboring Chico. 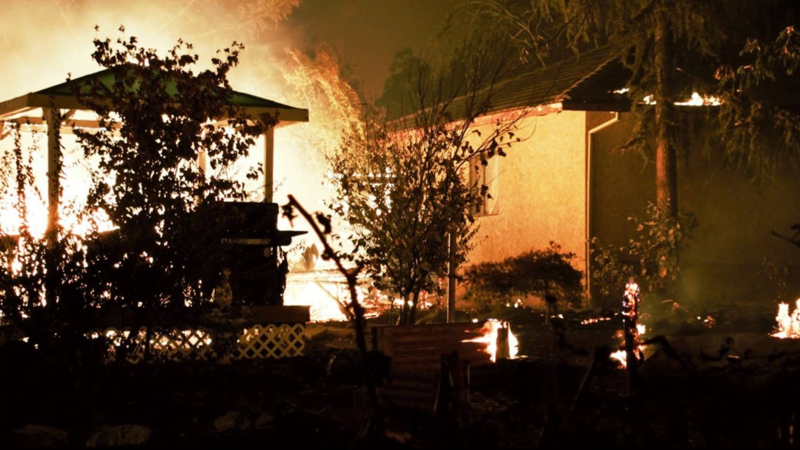 He evacuated his family and then returned to the fire to help rescue several disabled residents, including a man trying to carry his bedridden wife to safety. "It was just a wall of fire on each side of us, and we could hardly see the road in front of us." The fire is now just outside of Chico, prompting some evacuations on the outskirts of the city. Tens of thousands of people fled a fast-moving wildfire Thursday in Northern California, some clutching babies and pets as they abandoned vehicles and struck out on foot ahead of the flames that forced the evacuation of an entire town and destroyed hundreds of structures. Evacuation orders are established for Paradise, Magalia, Concow, Butte Creek Canyon and Butte Valley. Forest Ranch is under evacuation warning. There is one neighborhood on the West side of HWY 99 that is under evacuation near Durham. All areas in the City of Chico south of State Highway 32 and east of Bruce Road are under an evacuation warning. 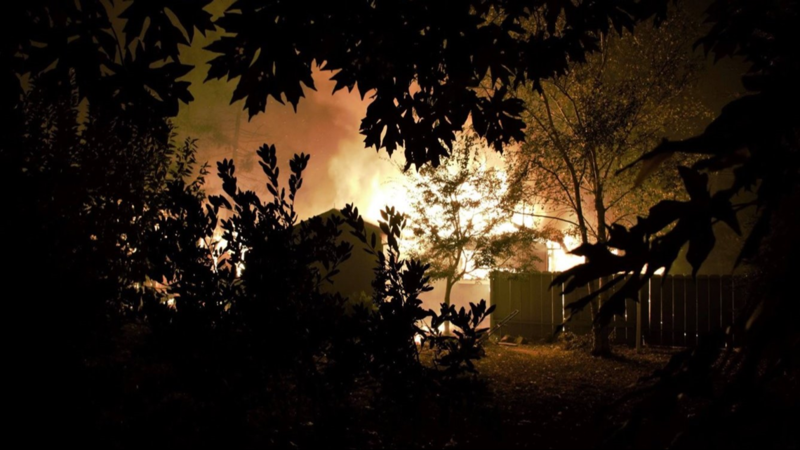 A fire official says the Northern California town of Paradise has been "pretty much" destroyed. CalFire Capt. Scott McLean says a wind-whipped wildfire destroyed thousands of structures but he said they won't have an exact count until they can get into the area. The town of about 27,000 people 180 miles (290 kilometers) northeast of San Francisco was evacuated. An Associated Press photographer found businesses and homes leveled or in flames, including a liquor store and gas station. RELATED: "California Wildfires: The New Normal" is ABC10's new 9-part series on how wildfires are changing lives across Northern California. The Camp Fire burning in Butte County has now consumed more than 20,000 acres, according to the latest numbers from CAL FIRE. 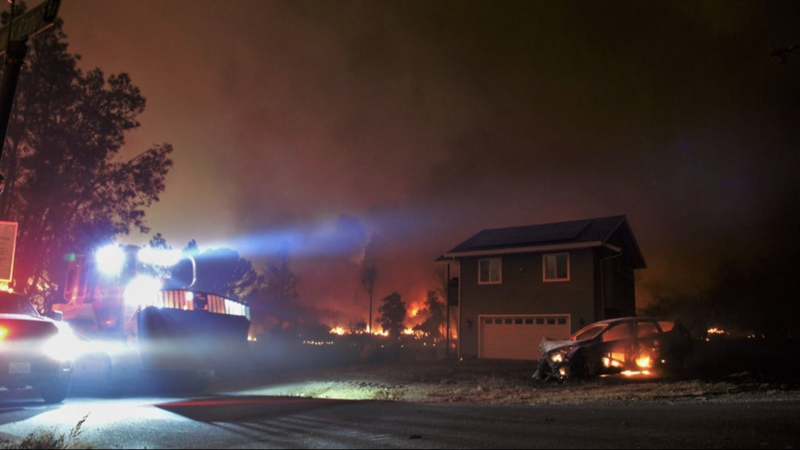 Hundreds of structures have been destroyed by the blaze, which prompted the entire town of Paradise, Calif. and its 27,000 residents to be placed under a mandatory evacuation order. 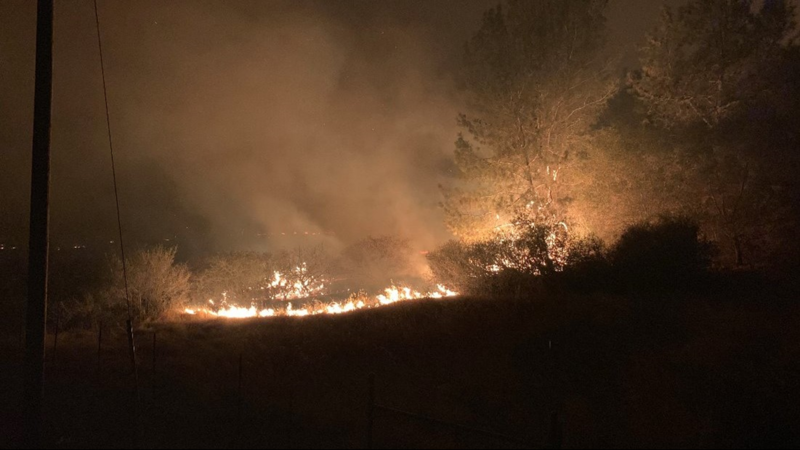 The fire, which is still 0 percent contained, is being driven by extreme fire conditions with high winds pushing the fire in a southwesterly direction. All schools in Butte County have ben canceled on Friday, including Chico State. As we continue to learn of the devastation in our neighboring communities, our hearts go out to all who are affected. The University will be closed tomorrow, Friday, November 9, out of an abundance of caution and in recognition of the impact on our students, faculty, and staff. The following areas remain under evacuation orders: Paradise, Magalia, Concow, Butte Creek Canyon and Butte Valley. Forest Ranch is under evacuation warning. There are multiple road closures in the area, including State Highway 70 between Pentz Road to Plumas County Line, Skyway, State Highway 99 from 149/99 junction to 9th Street Highway 191 and Pentz Road. Many people who fled a Northern California town to escape a wildfire say they don't know whether their homes survived. The police chief in the town of Paradise, Eric Reinbold, was in that group. Reinbold said Thursday he lives in the middle of town and doesn't know if his house is standing. The town of about 27,000 people 180 miles (290 kilometers) northeast of San Francisco was evacuated. An Associated Press photographer found businesses and homes leveled or in flames, including a liquor store and gas station. A California fire official says he has reports of several hundred structures that have been destroyed, but officials say they won't have an exact count until they can get into the area. The Butte County Sheriff's Office has issued new evacuation warnings as the Camp Fire continues to expand. According to the sheriff’s office, the evacuation warning does not include the City of Chico. -Hwy 32 at Nople Avenue down to the Chico City Limits. A police officer who helped residents escape a wildfire bearing down on a Northern California town says the town has been devastated. Officer Mark Bass said he returned to the town of Paradise on Thursday to find offices, large stores and restaurants leveled or burning. The town of about 27,000 people is 180 miles (290 kilometers) northeast of San Francisco. Bass is an officer in the nearby town of Chico. Another police officer in Chico, John Barker, said many elderly people live in Paradise and some are immobile. People posted photos on Twitter of missing seniors. Officials are describing a harrowing effort to rescue patients from a hospital in Paradise, a Northern California town ravaged by wildfire. Butte County Supervisor Doug Teeter said he was on a bulldozer that pushed cars out of the way Thursday to get to the Adventist Health Feather River Hospital in the town of Paradise. When he arrived there, patients were out in the front of the emergency room, where the roof had caught fire. The town of about 27,000 people is 180 miles (290 kilometers) northeast of San Francisco. He said sheriff's deputies helped patients evacuate. Butte County Sheriff Kory Honea said some people at the hospital were trapped in a tunnel. Butte College will close its main campus in Oroville today and tomorrow, November 9. The Glenn Center will remain open, but classes scheduled at the Chico Center, Skyway Center, and Cosmetology Center. The closures come in response to the evacuations and road closures from the Camp Fire. The main campus is being used as a CAL FIRE staging area. Chico State will close it's campus out of an abundance of caution on November 9. The Camp Fire is expected to grow toward the City of Chico, however, authorities have said that it is not likely to pose a significant threat to the city. 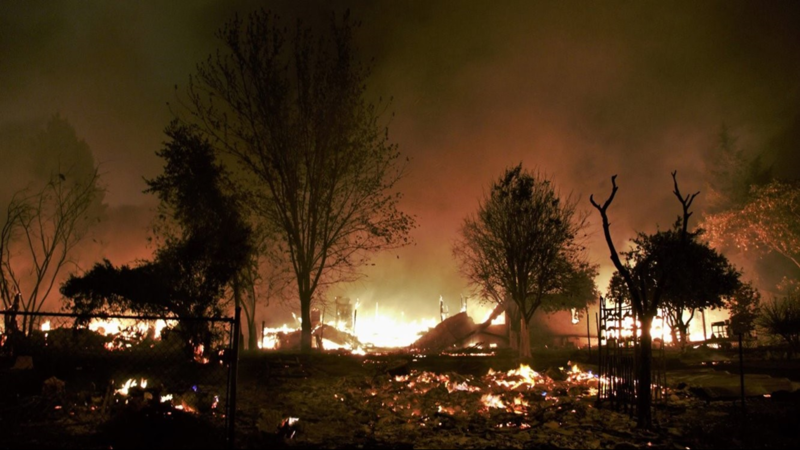 Per the Associated Press, several hundred structures have been destroyed due to the Camp Fire. Officials won't have a count until they can enter the area. Firefighters cannot save every structure from the fire, but they will save what they can. 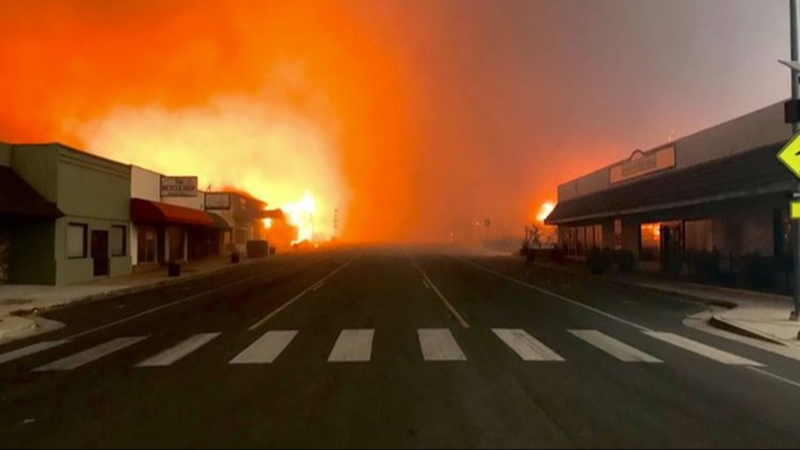 Per ABC10's Brandon Rittiman, many businesses in Paradise will be a loss. Per Butte county Air Quality Management District, smoke will continue to impacts areas next to and downwind of the Camp Fire. Poor air quality is expected for valley locations should the smoke settle overnight and in the morning. Smoke continues to impact areas adjacent to and downwind of the #campfire. Smoke is expected to settle overnight and in the morning potentially creating poor air quality conditions for valley locations. @bcaqmd has issued an Air Quality Advisory. More at https://t.co/kjRkiwSDNH. Adventist Health Feather River is closed, and all patients have been evacuated to Oroville Hospital and Enloe Medical Center. Earlier in the morning, with the Camp Fire in proximity, the organization took a precaution and evacuated all of their patients. The Neighborhood Church shelter in Chico is full, per Butte County. Oroville Nazarene Church and the Butte County Fairgrounds still have room available. The Neighborhood Church shelter in Chico is FULL. There is still room at Oroville Nazarene Church (2238 Monte Vista Ave, Oroville, CA 95966) and the Butte County Fairgrounds (199 E Hazel St, Gridley, CA 95948). Camp Fire could impact the City of Chico, however authorities don't see it as a significant threat to the city. Per ABC10's Brandon Rittiman, someone tried to hose down their home before evacuating, but it wasn't enough to save the home. Winds are expected to continue blowing toward the east, toward Chico, through the night. Camp Fire smoke will likely spread across Northern California over the next few days, according to the National Weather Service. Tens of thousands have had to evacuate due to the Camp Fire, which moved at rapid speed. ABC10's Brandon Rittman at the scene. "We've passed by dozens of burned homes on our way to get here, and you can see behind me some of the businesses on the main drag are in flames as we speak." Two firefighter injuries have been confirmed by CAL FIRE Butte Unit Chief Darren Read. Per the Butte County Sheriff Kory Honea, school in Butte County will be canceled tomorrow. Per Caltrans, with fire close to the freeway, Highway 191 and Highway 70 remain closed to traffic in both directions. Per the Butte County Sheriff's Department, 600 calls have been received for help or to check on people. 400 calls remain to be followed up on. If you have evacuated due to the Camp Fire, you can register at the Red Cross Safe & Well website, where family and friends can find search through a list of individual identifying as "safe and well." 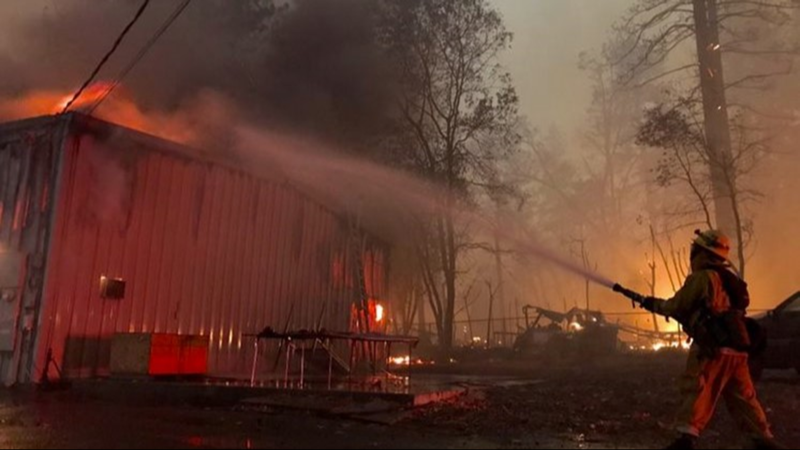 Redding Police Department responded with eight officers to help with the Camp Fire. ABC10's Giacomo Lucca has spoken with evacuees at the Church of the Nazarene. Albert Gurule, a Paradise resident, is among the evacuees at the church and told Luca that he's prepared for the worst, but hoping for the best. “So, I loaded up all of the stuff I could and you know got out of there just in the nick of time,” Gurule said. Wildfires are fought in part with firefighters from around the region. Fire crews from Sacramento, Folsom, Sacramento Metropolitan Fire District, West Sacramento, Cosumnes Fire, Turlock Fire Department, and even San Francisco are responding to the Camp Fire. From Stanislaus County to Butte County, Turlock Fire Department responding with 4 firefighters for mutual aid. Due to California wildfires in Northern California, the following roads were closed. John Bartell is live at the scene in a community just outside of Paradise as firefighters attempt to protect homes. A Caltrans camera in Chico observing Highway 32 captures an image of the area. Due to the Camp Fire smoke, the photo looks like it was taken at dusk. 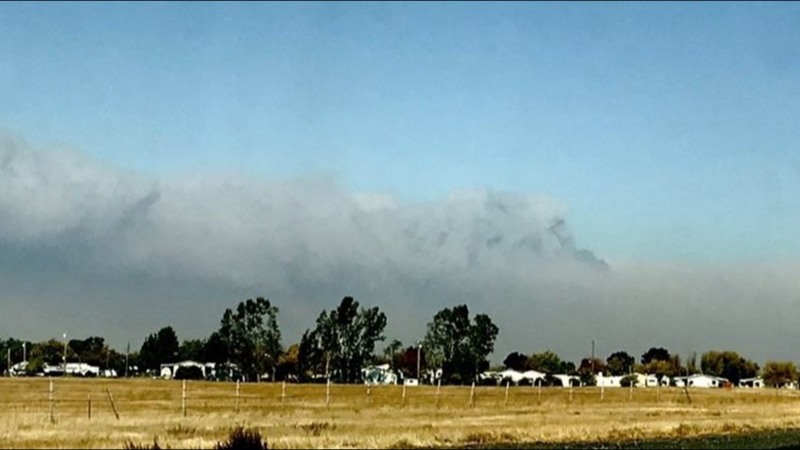 ABC10's Madison Meyer shares what some residents are going through as they evacuate their home in paradise. 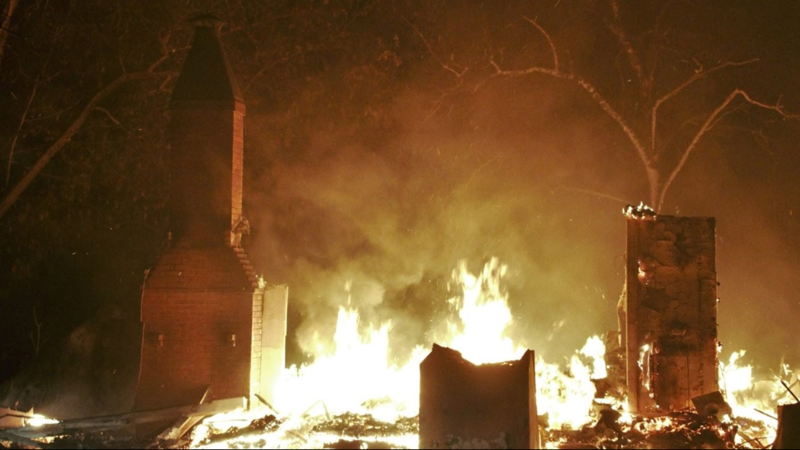 Whitney and Joe Allen's Paradise home is gone, but they are safe and together. Per CHP - Oroville, Highway 99 northbound lanes are open. If you have evacuated due to the Camp Fire, Butte County is asking you to register at the Red Cross Safe & Well website. Family and friends will be able to search through the list of people who have registered and identified themselves as "safe and well." Concerned family and friends can also search the list of those who have registered as “safe and well” by clicking on the “Search Registrants” button. For those concerned about Chico State University as the Camp Fire spreads, the campus says no evacuation orders are in place in the City of Chico, but staffing impacts have resulted in classes being suspended for the remainder of the day. Classes at Chico State are expected to resume tomorrow. Smoke from the Camp Fire spread much of Northern California, according to the National Weather Service. 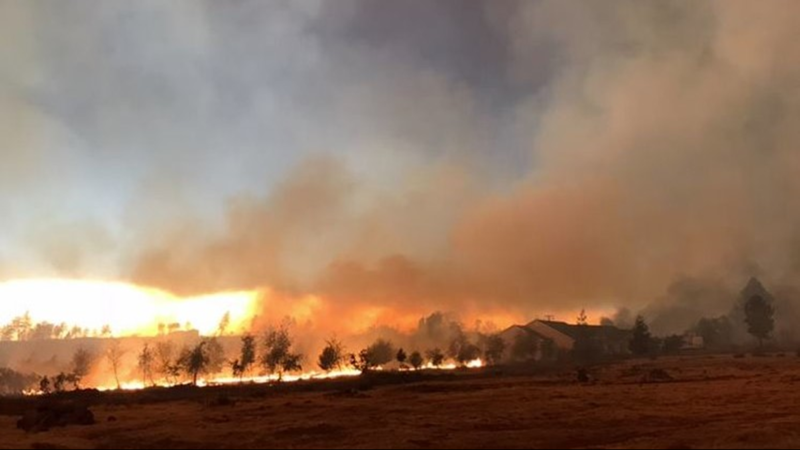 ABC10's Giacomo Luca says firefighters are facing heavy winds as they attempt to combat the Camp Fire and deputies from the Sheriff's department are moving traffic as the fire jumps Pentz Road and threatens homes. Residents have been evacuating the area, including those like Meadow Springs Road. Bob Anderson, 83, of Yankee Hill told Luca that he and his wife had to evacuate in only a matter of minutes. Cal Fire says the Camp Fire has now grown to 18,000 acres. Acting Governor Gavin Newsom declared a State of Emergency in Butte County because of the Camp Fire. The declaration says the fire has destroyed homes, threatened critical infrastructure and caused the evacuation of residents. Current Governor Jerry Brown is not in the state right now. ABC10's Brandon Rittiman is at the Camp Fire. He's hearing explosions while buildings burn near the town of Paradise. Local firefighters from around the area are heading to the Camp Fire to provide mutual aid. Sacramento Metropolitan Fire District has deployed a third strike team. Strike teams comprise of firefighters from Sacramento, Folsom, Cosumnes Fire, and and West Sacramento Fire Departments. As a precaution, Butte College has closed their campus today and tonight due to the fire evacuation for the Concow and Paradise areas and road closures; the main campus is not threatened. In response to the fire in Butte County and evacuations, Highway 99 at B Street will be shut down to northbound traffi, per Gridley - Biggs Police Department. Authorities say to find an alternative route and avoid the area. Police also acknowledge that Highway 70 at 149 is closed to northbound traffic. With large scale evacuations in process, local Placer County deputies have arrived to provide mutual aid with the Camp Fire. Schools in the Paradise Unified School District have been evacuated due to the Camp Fire. Earlier in the day, parents were advised to pick up their students with district staff supervising. 1:12 p.m update: CAL Fire says the Camp Fire has grown to 17,00 acres. Due to heavy evacuation traffic, all northbound lanes on Highway 99 at Highway 149 are now closed. California Highway Patrol has shifted all traffic from Skyway to Highway 149 to the southbound direction. 12:34 p.m. update: California Highway Patrol issued a traffic direction order for all traffic to be diverted southbound using all lanes to avoid the campfire area. 12:30 p.m. update: Tens of thousands of people were ordered to evacuate a fast-moving wildfire that exploded in size Thursday, threatening several Northern California communities and forcing panicked residents to race to help neighbors who had to drive through walls of flames to escape. 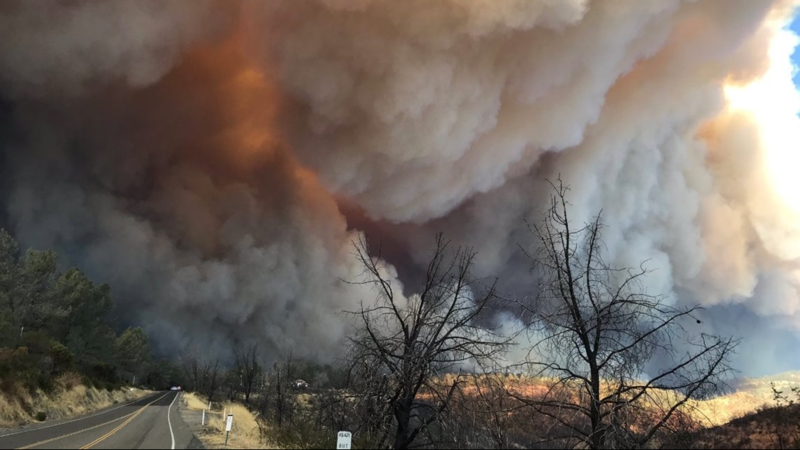 Butte County Sheriff's spokeswoman Miranda Bowersox said that all of Paradise, a town of about 27,000 people 180 miles (290 kilometers) northeast of San Francisco, was ordered to evacuate. "It's bad," Butte County Sheriff Kory Honea told the Enterprise-Record. "We're trying to get as many people out as quickly as possible and save as many lives as we can." 11:54 a.m. update: Butte County Sheriff issued an evacuation order for the area of Highway 70 from Concow South to Yankee Hill on both sides of Highway 70. 11:00 a.m. update: CAL Fire reports the fire is now at 5,000 acres. The Butte County Sheriff's Office issued an evacuation order for Centerville and Butte Creek areas. RELATED: California Wildfires: The New Normal. An ABC10 9-part series. The residents of Pulga have been issued a mandatory evacuation due to a nearby fire. The Camp Fire, as it's being called by Cal Fire, is roughly 1,000 acres and just north of Oroville. It's currently located near Camp Creek Road and Pulga Road, Jarbo Gap, and off Highway 70 along the Feather River Canyon. 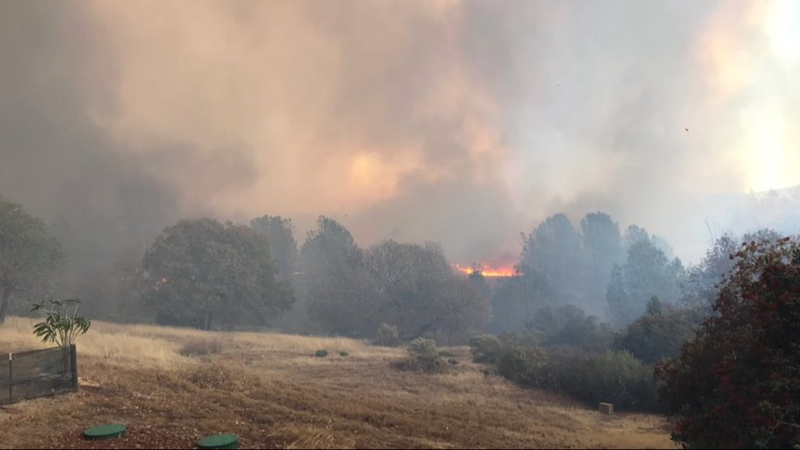 The Butte County Sheriff's Office says an evacuation order was issued Thursday for areas of Paradise, a town of about 27,000 people. Fire officials say firefighters are working to access the area and that the blaze continues to spread. Two evacuation shelters have been established at Oroville Nazarene Church, 2238 Monte Vista Ave, Oroville; and Neighborhood Church, 2801 Notre Dame Blvd, Chico. Caltrans has issued an emergency closure of SR-70 to eastbound traffic at Pentz Road and westbound traffic at Greenville Wye. The National Weather Service has issued a red flag warnings in much of Southern California and Northern California, saying low humidy and strong winds are expected to begin Thursday morning and continue through Friday evening. This is a developing story. Stay with ABC10 for more information as it becomes available.